Coriander is a striking plant when it blooms, marvelous white irregular shaped flower heads top the plants by the beginning to the middle of the summer. Coriander is a very nice herb, actually not much used, and that’s a pity. I like especially the use of the leaves, which are great added to tomato sauces or other things. These leaves are produced abundantly during spring and autumn, in summer plants tend to bolt quite quickly. Young seedlings sown before the winter are surprisingly hardy, and take quite a bit of frost. They start regrowing in spring when the ground heats up a bit, and give a crop very quickly. Another use are the seeds, they are ground and added to curries and other oriental dishes . 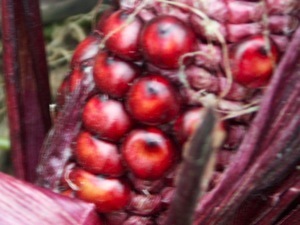 Indian or squaw corn is the corn that was cultivated a lot by native North American people, very easy to grind and used to make all sorts of bread-like things. Most of the corns are hybrid varieties, but luckily there are still some open-pollinated corn varieties, with an amazing colour variability. Also known as mâche. A favourite winter crop for many organic farms in West-Europe, it grows at quite low temperatures and is very resistant to frosts. Actually, I have never tried to grow corn salad (valerianella locusta) in any other season. The taste of the leaves is mild, a bit sweetish, tender. They can be used for salads, and for hot dishes. Now, these are nice little plants, they have some reputation of being weedy, but they are certainly not weedy in my garden, although they do take a bit more space every year (and I have been growing these for more than 15 years). Crosne (stachys affinis) is grown for the edible tubers, that are formed during late summer and (especially) autumn. The tubers can reach up to 10 cms, but they usually stay a bit smaller, 8 cms or less. They have a very good taste when they are fried in a bit of oil for just about 15 minutes (just add a pinch of salt to improve the taste). Crosne seems to like a soil that’s on the wet side, the plants stay very small , usually not bigger than 40-50 cms. Now, apparently I lost or misplaced my cucumber pictures, I don’t find them... Cucumbers (cucumis sativus) not only come in their familiar shape (long, dark green and not ‘fat’), but there are also round, oblong, fat and other sorts of cucumber. The plants are easy to grow, they do require a bit of warmth, a good fertile soil and preferably some extra heat around the roots. There are some varieties that can be grown outside over here (lemon, crystal apple,telegraph,...) . Some oriental cultivars have been created, they are longer and thinner compared to ours, but these are even more demanding in heat.